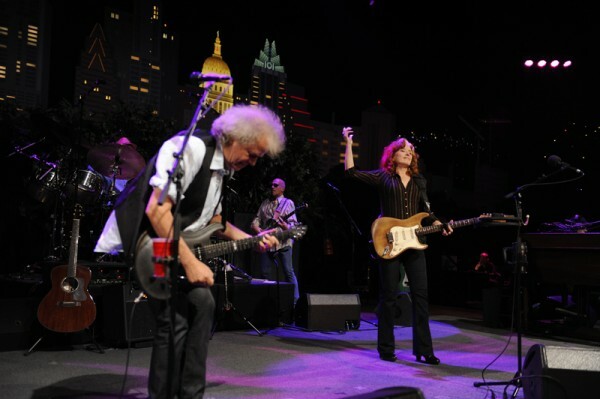 ACL @ the Alamo returns on August 27 with a special evening featuring Stevie Ray Vaughan. 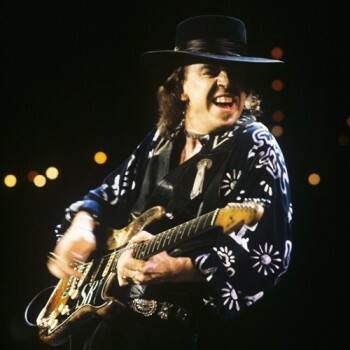 First up is Stevie Ray Vaughan: A Retrospective, our season 20 episode that combines the Texas guitar slinger’s 1984 and 1990 appearances with his band Double Trouble. All your favorites are here: “Love Struck Baby,” “Texas Flood,” “Pride and Joy,” “Cold Shot,” “Crossfire” and an absolutely incandescent version of “Riviera Paradise.” While these performances have been released on DVD before, they’ve never been seen before on a big screen, and we’re excited to make that happen. Following the Retrospective will be A Tribute to Stevie Ray Vaughan, a PBS pledge special filmed in the ACL studio that presents Stevie’s music as performed by his friends and fans, including B.B. King, Eric Clapton, Bonnie Raitt, Buddy Guy, Robert Cray, Dr. John and, of course, Stevie’s brother Jimmie, who also leads the band. Far from a somber occasion, this show is a true celebration of Stevie’s musical legacy, with joyful performances. As with the Retrospective, this has been available on DVD but never shown in a theater. As always, this screening benefits the Health Alliance for Austin Musicians, a most worthy organization. You can find the skinny on tickets here. If you’re in Austin, please join us! 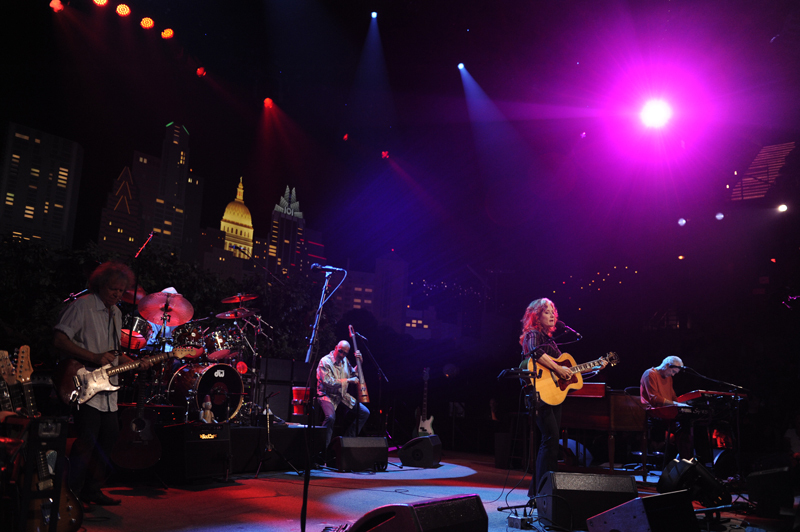 “Thanks for comin’ out to see our soul sisters extravaganza tonight!” exclaimed Bonnie Raitt as she took the ACL stage. 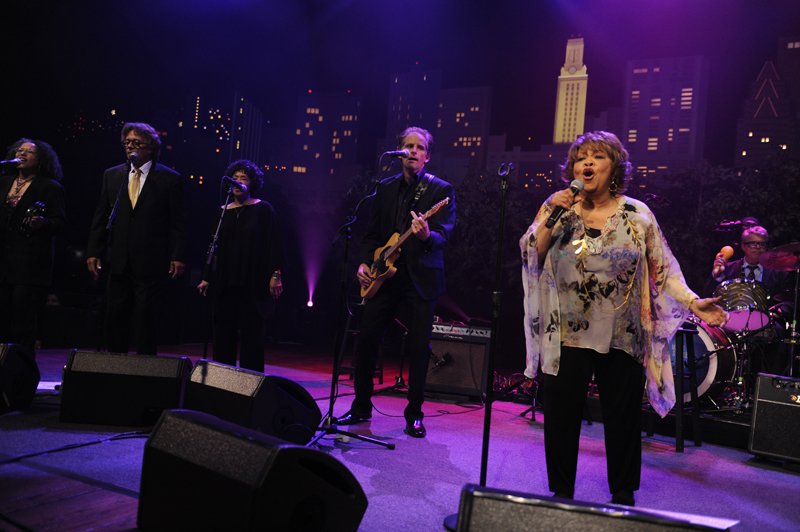 Tonight’s taping was a double-header, with not only the bottleneck guitar-slinging Raitt, but also soul/gospel legend Mavis Staples putting her formidable pipes through their paces. 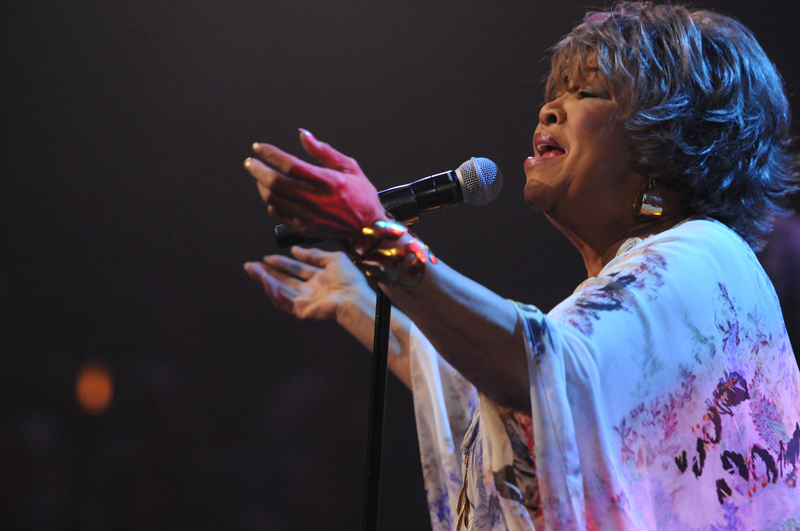 For fans of powerful, R&B-derived singing, this show was a little slice of heaven. 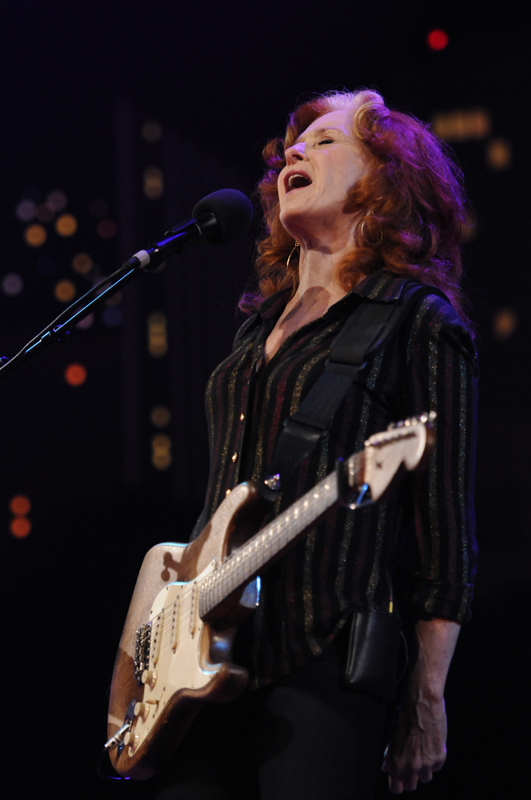 It’s been ten years since Bonnie Raitt has appeared on the show, so anticipation ran high. Raitt and her veteran band easily met all expectations, however. She opened with “Used to Rule the World,” a funky blues rocker with a slinky slide solo that’s the opening cut from her latest album Slipstream. She continued through a set heavy on the acclaimed new LP, from the snarky rocker “Down to You” and the reggae-infused makeover of Gerry Rafferty’s “Right Down the Line” to the smoky blues take on Bob Dylan’s “Million Miles” and the folk-rocking commentary of “Marriage Made in Hollywood.” The highlights of the new songs may have been a pair of gorgeous ballads, “You Can’t Fail Me Now” (co-written by Loudon Wainwright III and Slipstream producer Joe Henry) and “Not Cause I Wanted To.” She peppered the set with some of her classics as well, dedicating the funky hit “Love Sneakin’ Up On You” to the late Austin guitarist Stephen Bruton, who served many years in her band, and giving her smash version of John Hiatt’s “Thing Called Love” an extra swampy flavor. 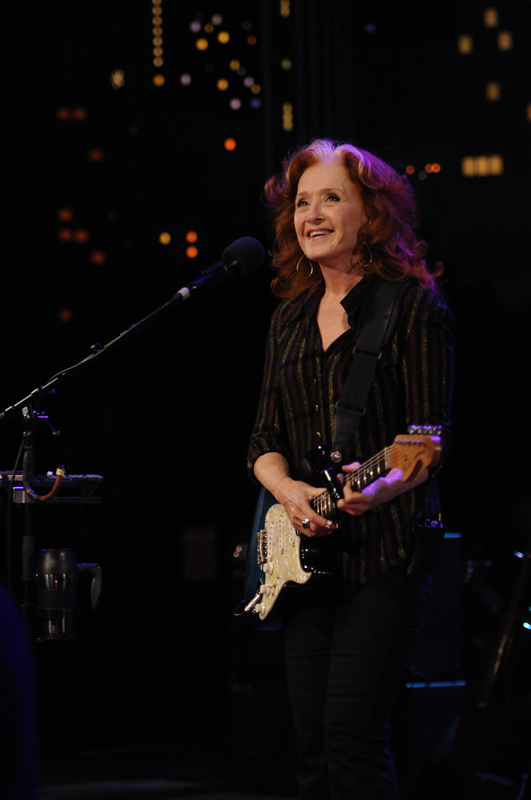 Raitt closed her performance with a shimmeringly atmospheric “Angel From Montgomery,” letting John Prine’s classic tune settle over the crowd like a soft rain. It was a gentle comedown for an otherwise fiery show. 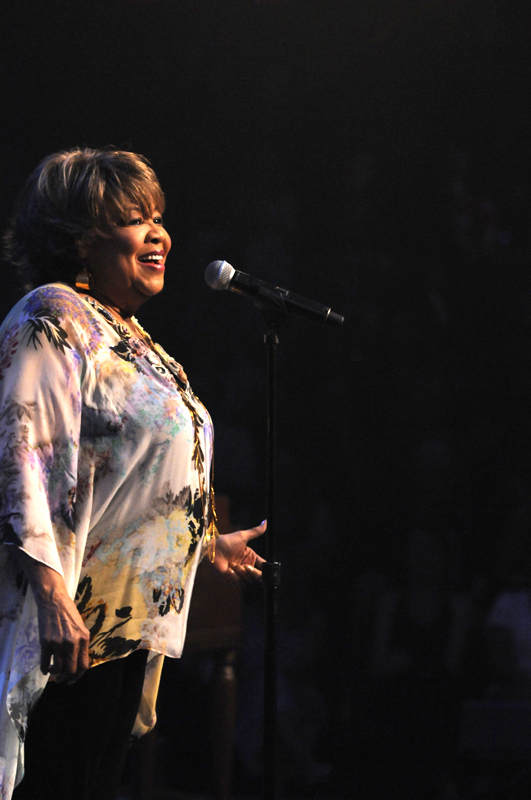 “We come this evening to bring you some joy, some inspiration and some positive vibrations,” declared Mavis Staples in the middle of her set, and there’s no way anyone present didn’t get that. Making music since she was (gulp) ten years old, Staples is a veteran, but her performance tonight underscored that, at 72, she’s still as much about passion as professionalism. 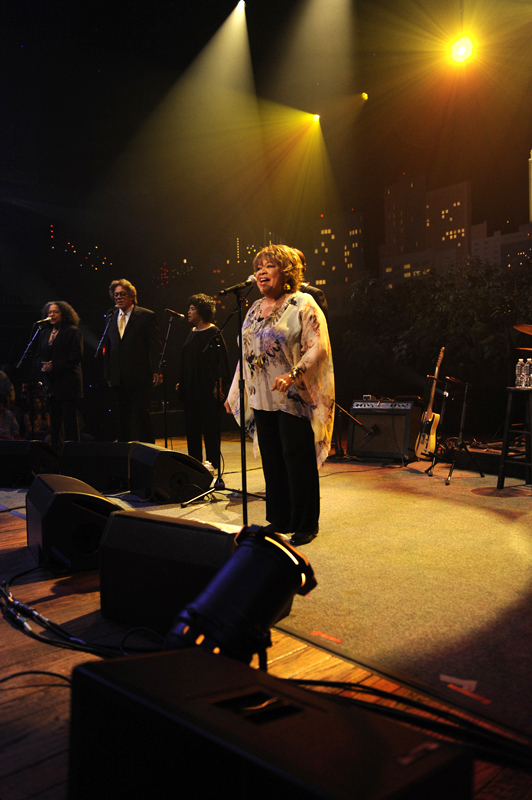 Her set began with the a cappella “Wonderful Savior,” a simple gospel tune to set the mood. Ramping up the energy Mavis shared space with guitarist Rick Holstrom’s biting tone on “Creep Along Moses.” A stately cover of Creedence Clearwater Revival’s “Wrote a Song For Everyone” kept the buzz at maximum. “Freedom Highway” and “Eyes On the Prize” hearkened back to the 60s, when the Staple Singers were the musical voice of the civil rights movement, while “You Are Not Alone,” the Jeff Tweedy-composed title track to her latest LP, testified to her stunning way with a ballad. 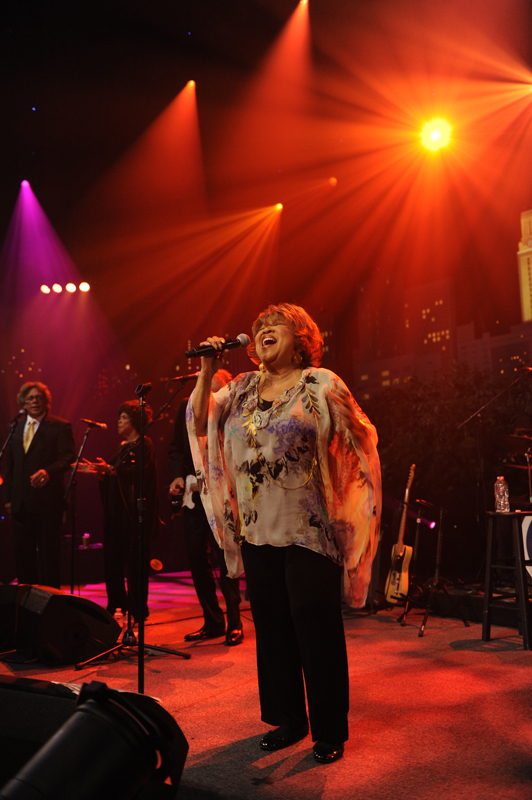 “I’ll Take You There” became the call-and-response gospel epic it was always meant to be and left the crowd hanging on, waiting for more as Mavis left the stage. 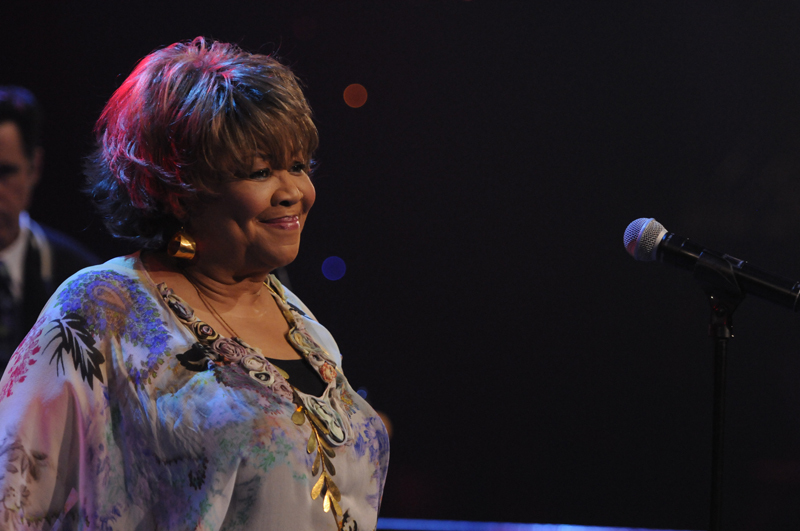 When she returned for an encore she was joined by Bonnie for a heartfelt take on Randy Newman’s “Losing You” – “this song is very special,” claimed Mavis, “It’s for both our fathers” – and a rousing, groovy “Will the Circle Be Unbroken” put the entire studio in the spirit. But in a show overflowing with highlights, perhaps the biggest was her version of the Band’s “The Weight.” Mavis performed on the version in the film The Last Waltz and claimed it as her own tonight, sharing the vocals with her singers and bringing the audience to a wild standing ovation. 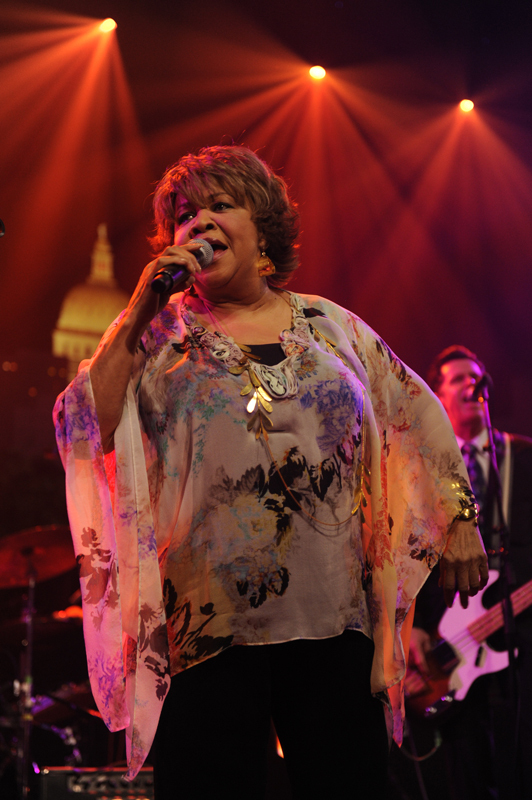 Mavis claimed in her interview that she’s long wanted to be on Austin City Limits and that she was thrilled to be here, and we can only say: right back atcha, ma’am – “Meeting Mavis is like going to church,” says associate producer Leslie Nichols. This is a show that will pass into ACL legend. We always say we can’t wait for y’all to see these performances, and we couldn’t be any more heartfelt with that sentiment after this show. 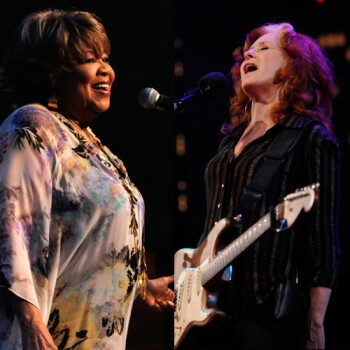 Bonnie Raitt and Mavis Staples – can it get anymore soulful? Find out for yourselves this fall when this episode airs on PBS.